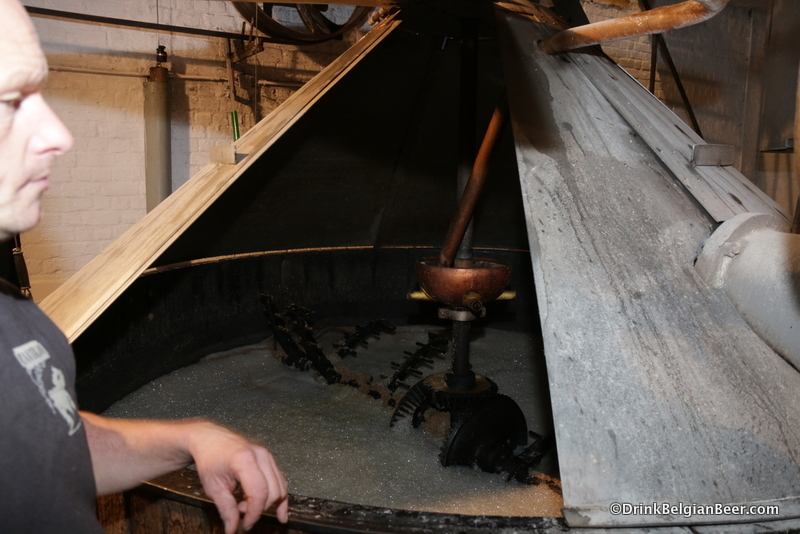 The critically important process of mashing the grains with hot water is a multi step operation, and takes about 2.5 hours overall. 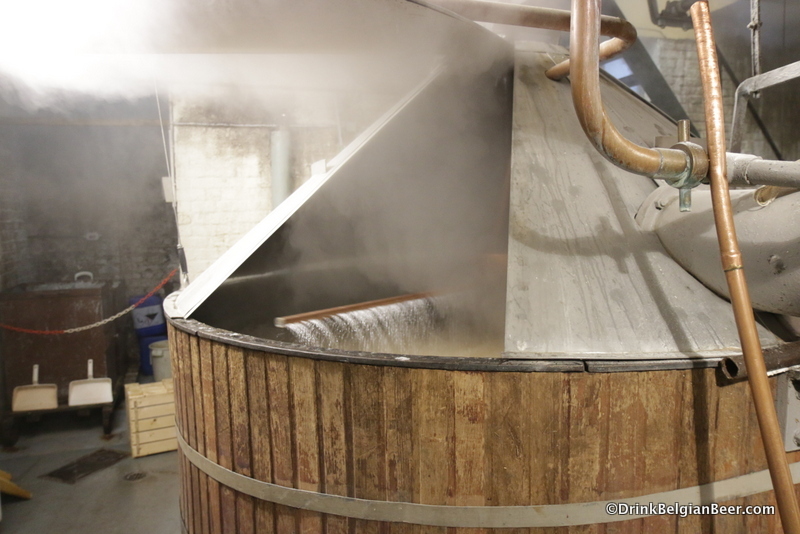 The temperature of the wort inside the mash tun is raised from about 45 degrees Celsius (113 degrees Fahrenheit) to about 72 degrees Celsius (162 F) by adding hot water of different temperatures over the course of the mashing in process. 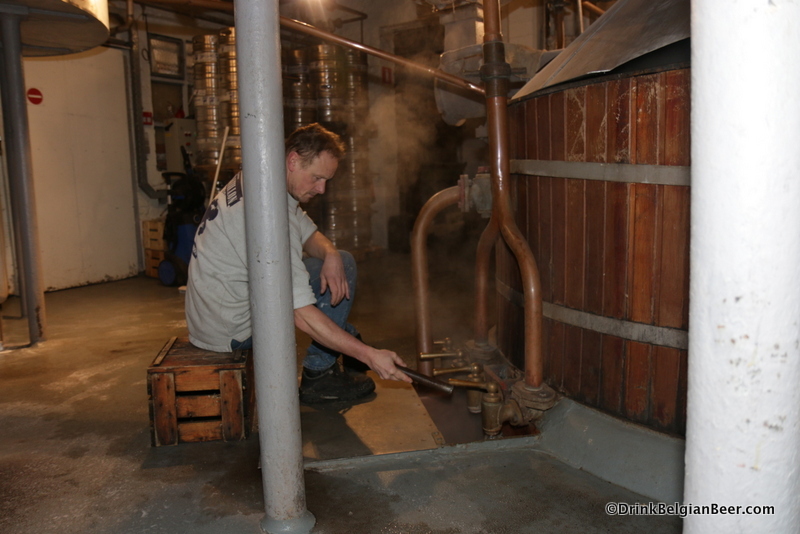 Brewmaster Jean Van Roy checks the temperature of the mash by inserting a thermometer into the mash tun. The copper plates at the bottom of the mash tun act as filters so that wort can be separated from the grains and pumped out of the mash tun. These filter plates are sometimes referred to as a false bottom. 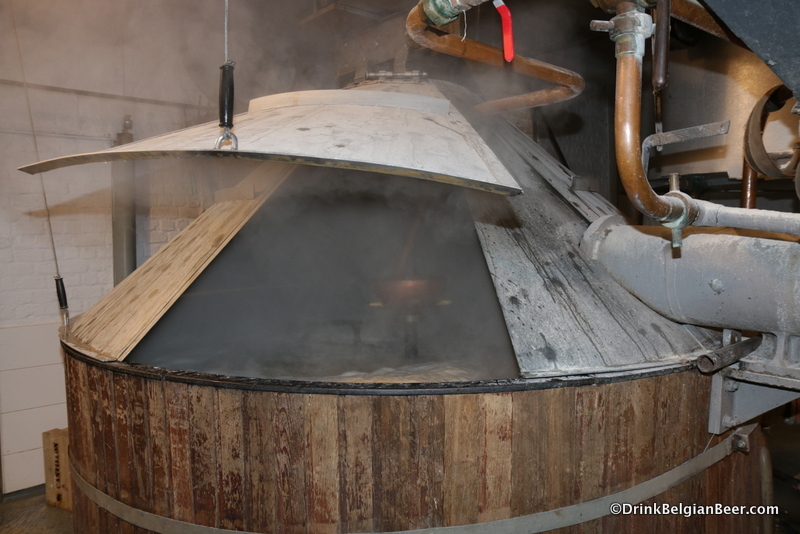 When mixed with hot water, about 10,000 liters of wort (100 hectoliters, or about 85 U.S. barrels) are produced by the mashing process. 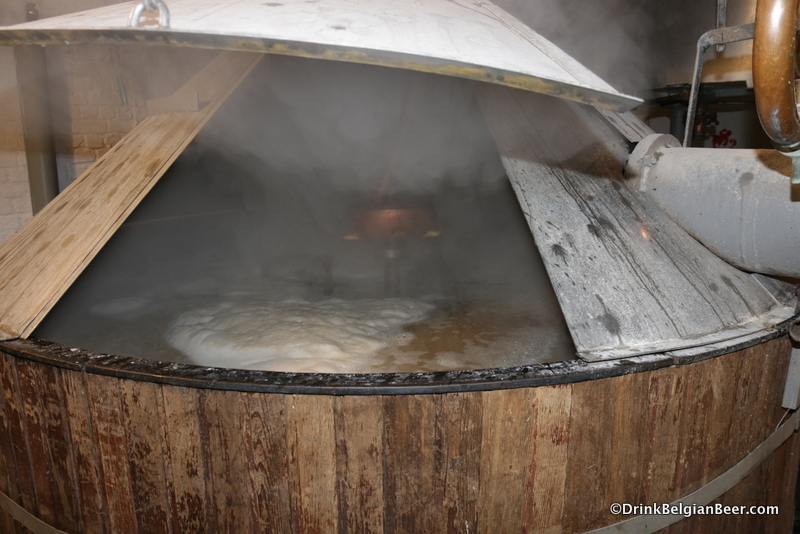 The process of boiling the wort causes the loss (evaporation) of about 25% of the liquid, so about 7,500 liters (75 hectoliters, or 64 U.S. barrels) of wort remain after boiling. The mash tun at Brasserie Cantillon, cleaned and ready for a brew day.The copper plates at the bottom of the mash tun act as filters so the wort can be separated from the grains and pumped out of the mash tun. These filter plates are sometimes referred to as a false bottom. 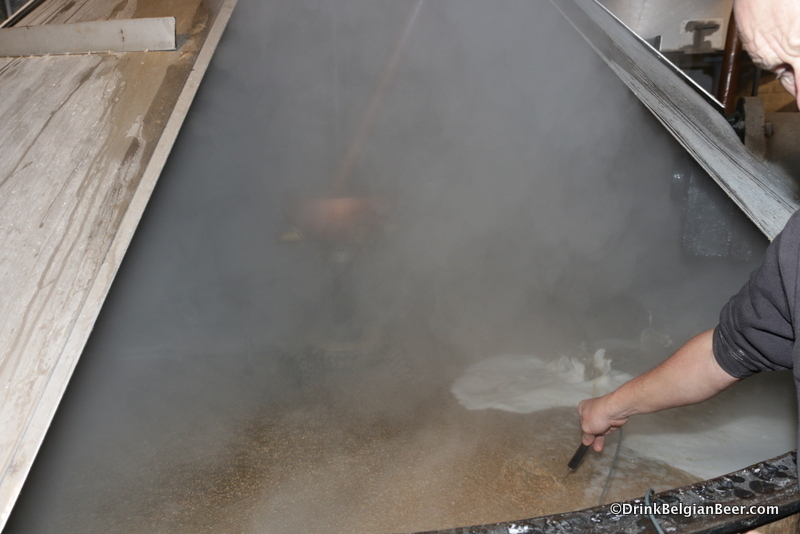 The mashing of the grains with hot water in full action. 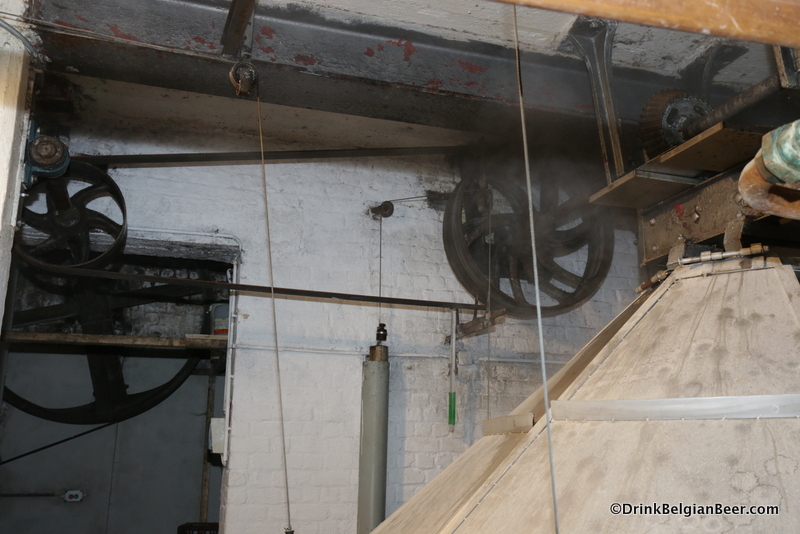 You can see hot water being pumped into the mash tun, on the right. 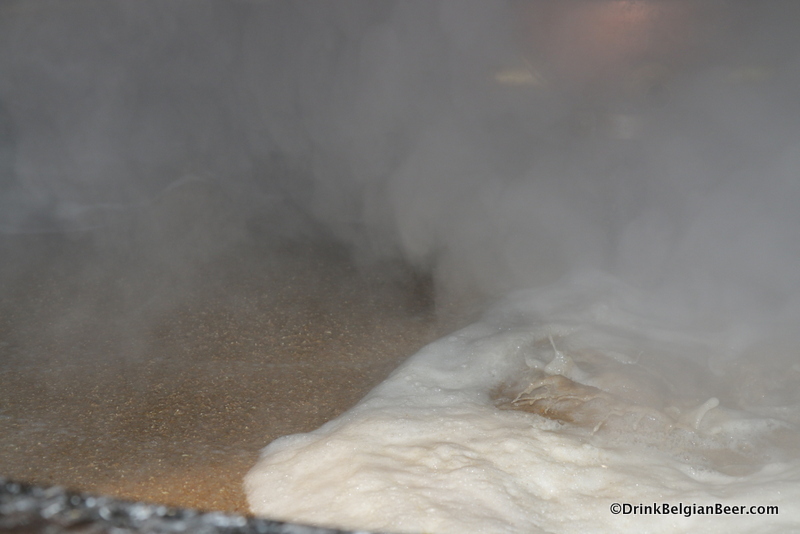 Hot water pours into the mash tun at Cantillon from a copper pipe on the right. 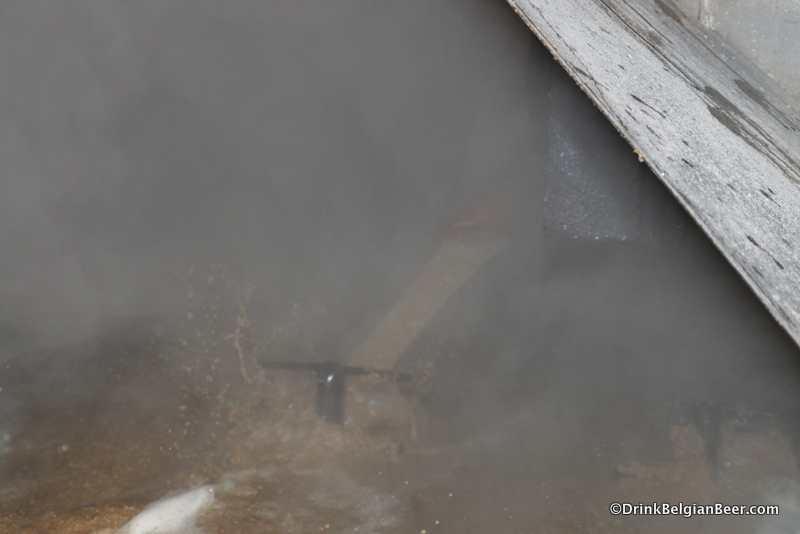 Close up of hot water being pumped into the mash tun via a copper pipe on the right. 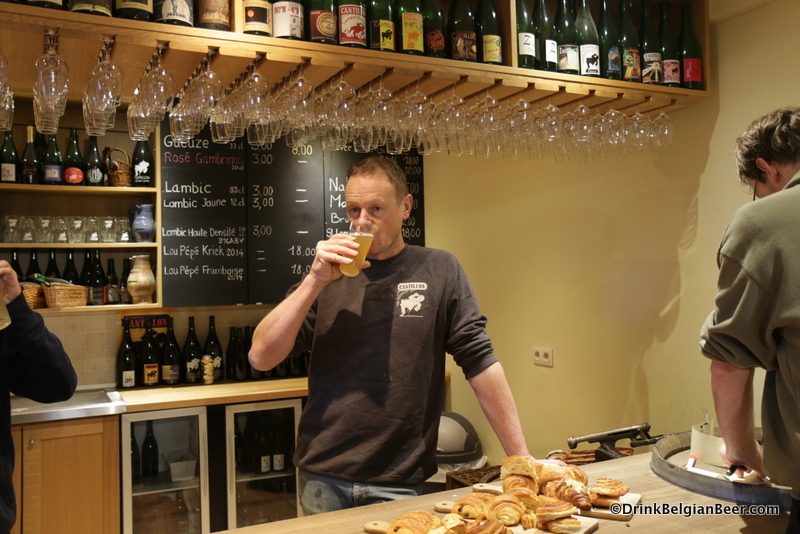 Brasserie Cantillon. 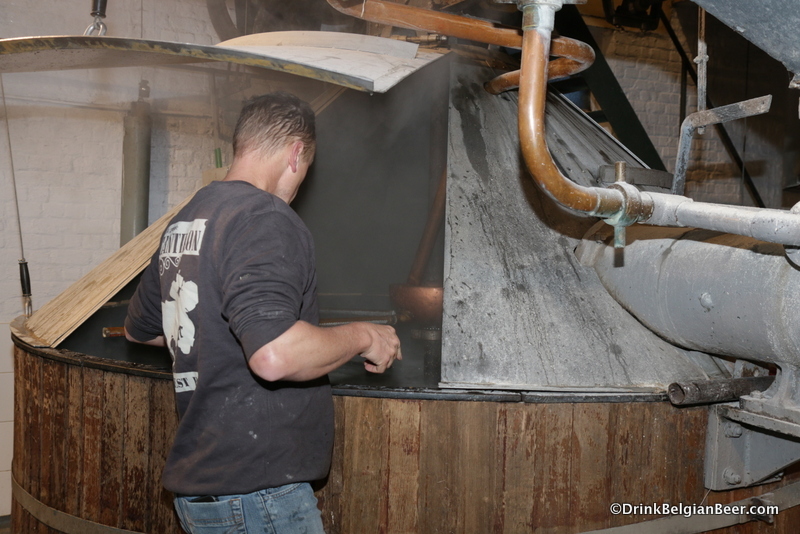 The mash tun at Brasserie Cantillon, in action. 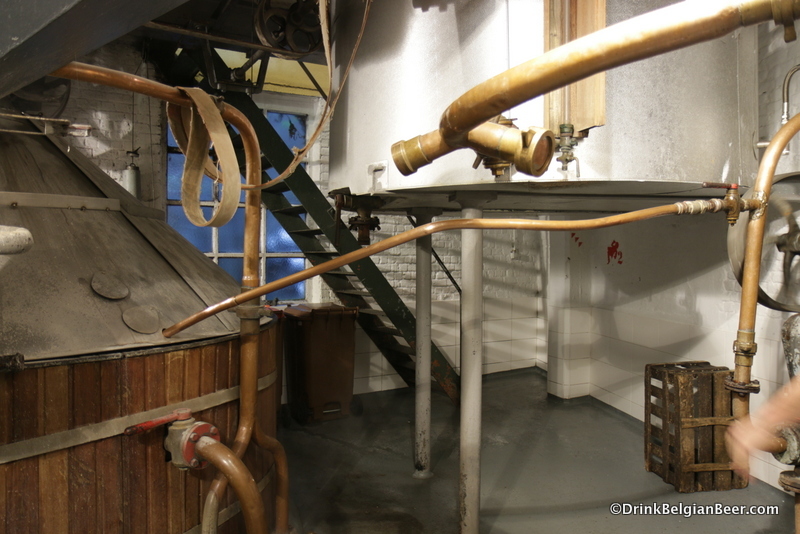 Another view of Brasserie Cantillon’s mash tun. Checking the temperature of the mash with a thermostat. 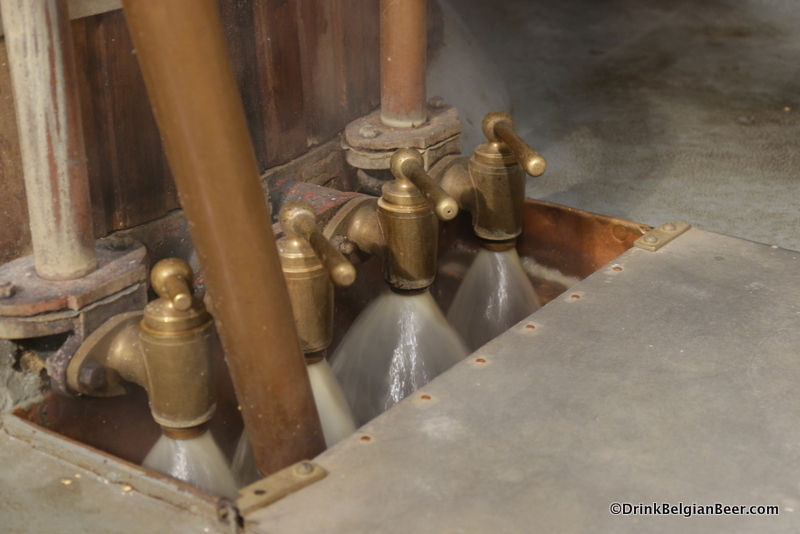 Hot wort (a tea-like liquid) flows through the taps on the mash tun at Brasserie Cantillon. 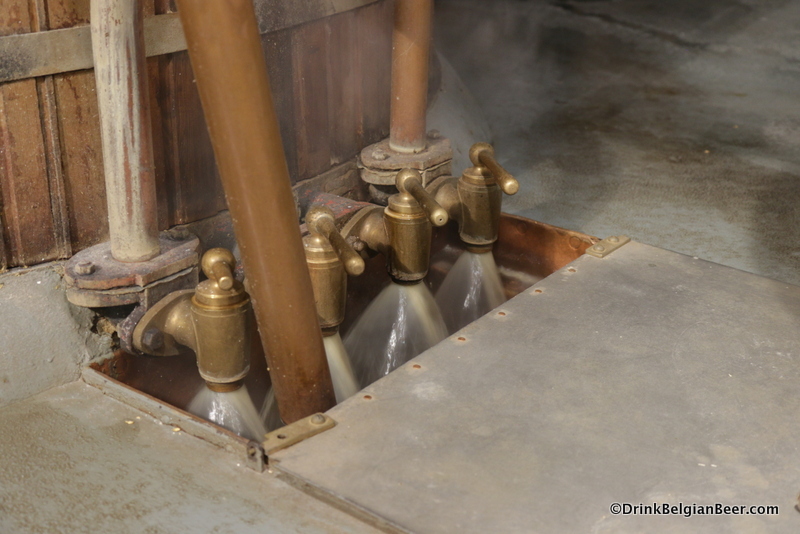 Another shot of the mash tun taps in action pumping out hot wort at Brasserie Cantillon. 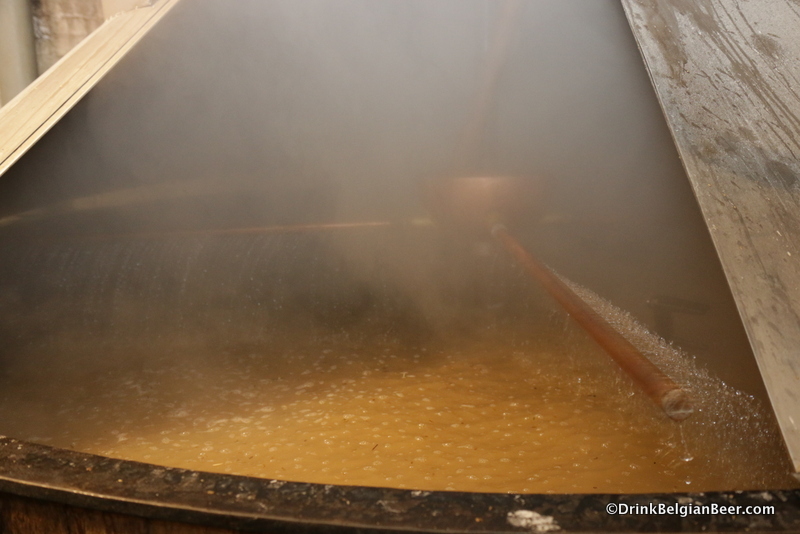 This wort is the basis for lambic beer, prior to fermentation. 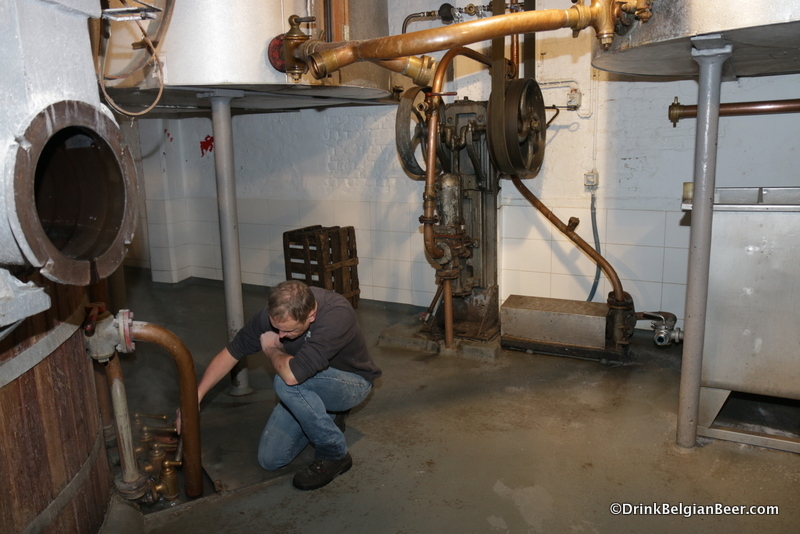 Jean Van Roy checking the mash tun taps to be sure they are operating at maximum efficiency. 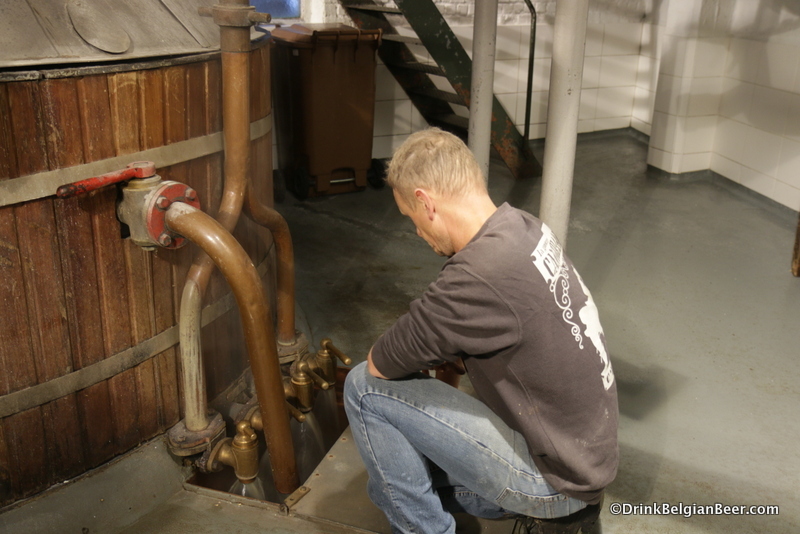 Jean Van Roy adjusting the taps on the mash tun. You can see the bottoms of the boiling kettles on the right and left in the background. 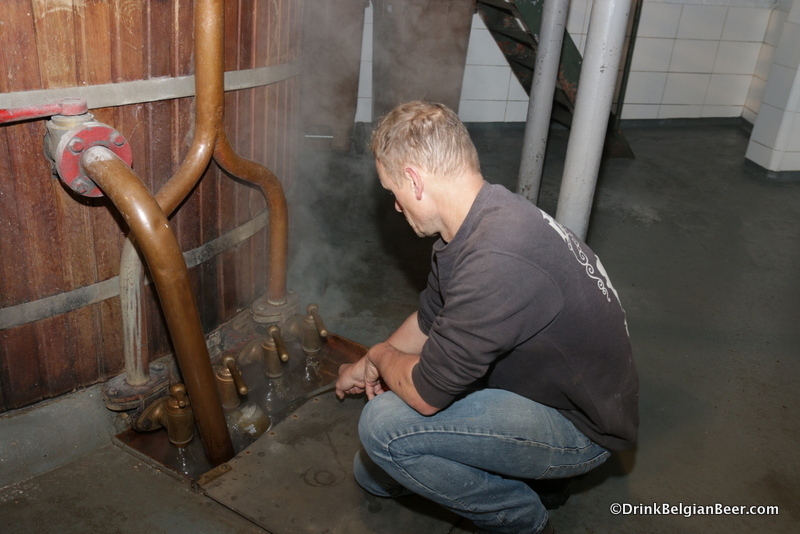 Jean Van Roy checking on the mash tun taps. 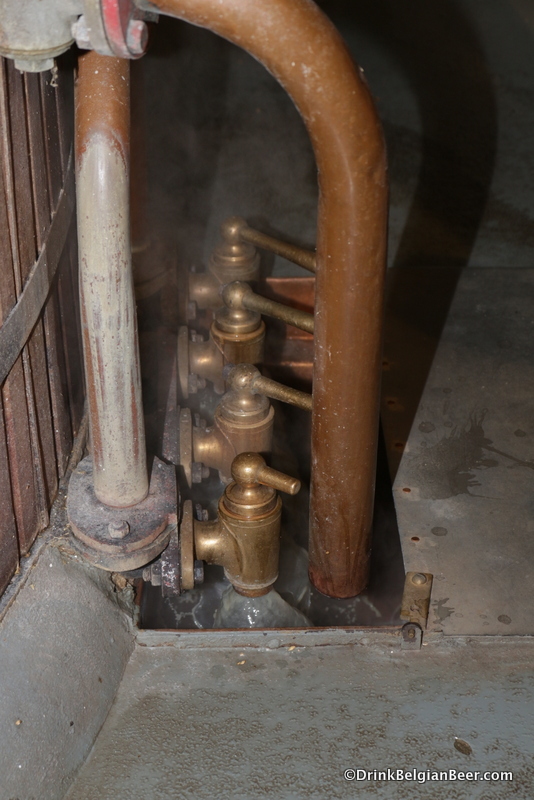 A side view of the mash tun taps in action. 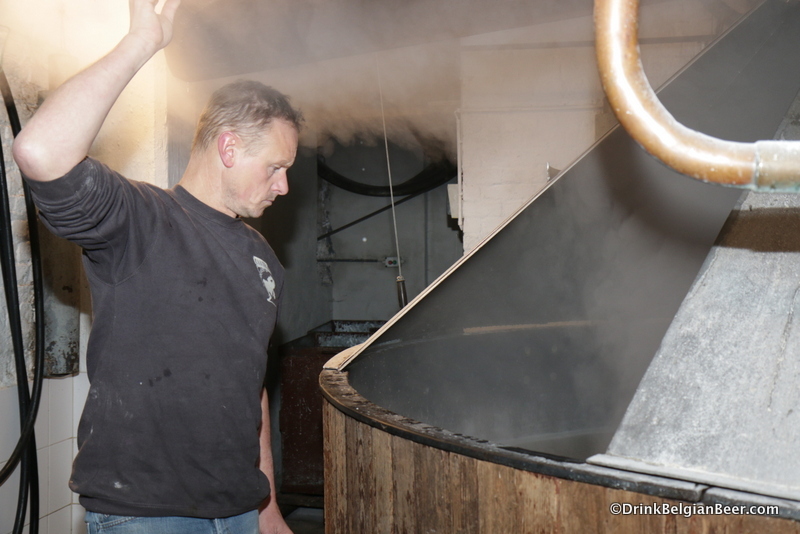 Jean Van Roy, keeping a close eye on the progress in the mash tun. Brewmaster Jean Van Roy shutting down the mash tun taps for a moment. 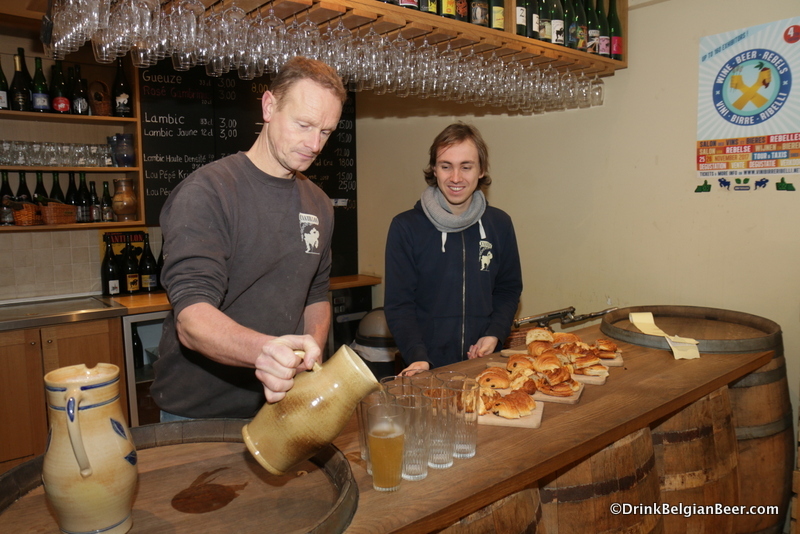 The mash tun taps in action at Brasserie Cantillon. Van Roy watching over the hot wort flowing out of the mash tun taps. 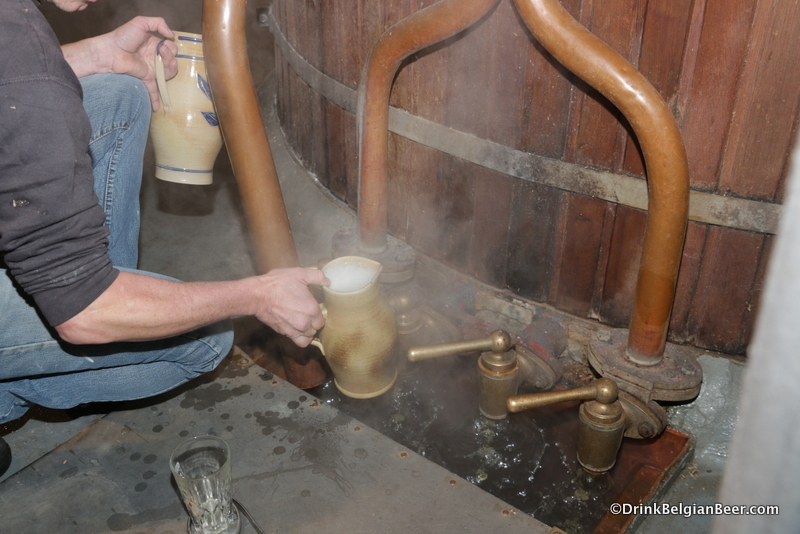 Cantillon brewmaster Jean Van Roy, preparing to assess the progress of the wort. 9:51 am. Van Roy, adjusting a tap with a copper bar. 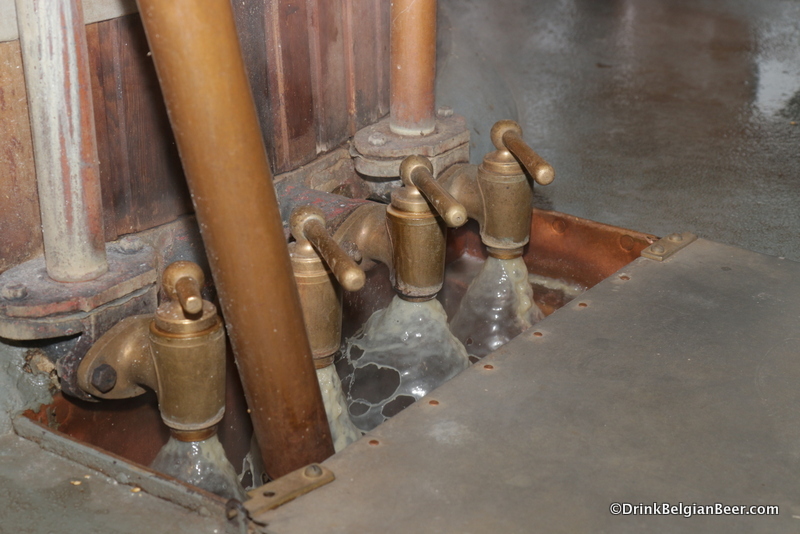 A close up of the Cantillon mash tun taps in action. 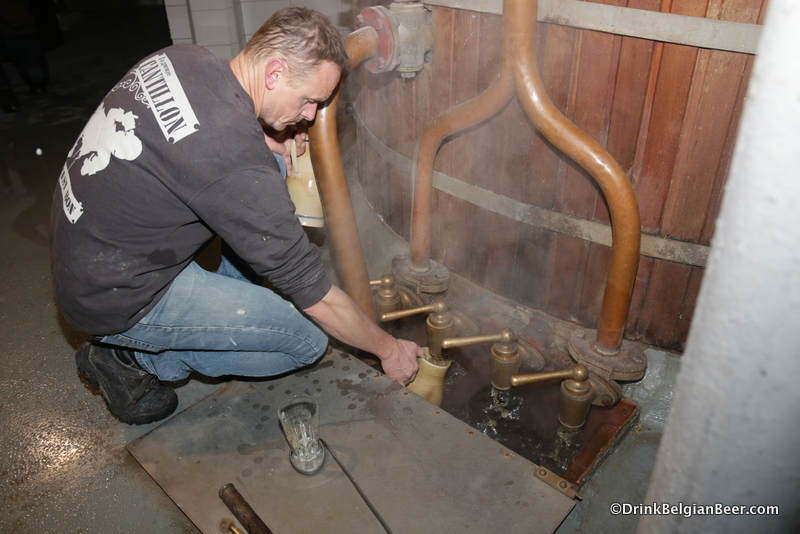 Jean Van Roy pulling a sample of hot wort from a mash tun tap. 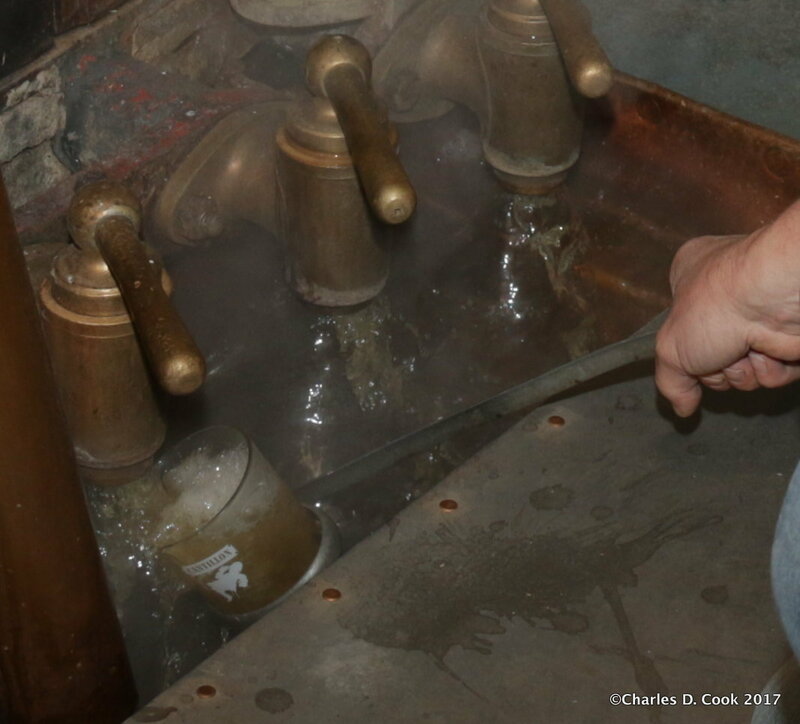 Close up of glass of wort being filled from a tap on the Cantillon mash tun. 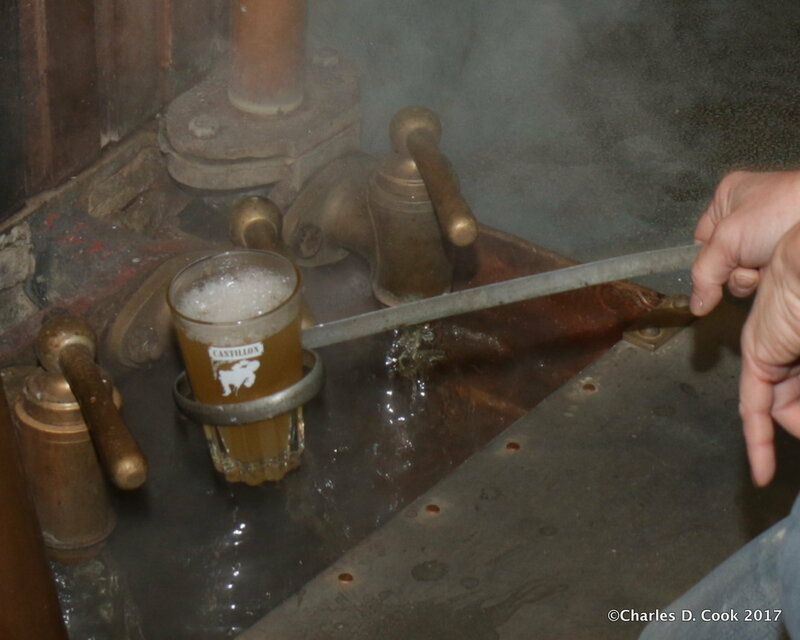 Close up of a glass of hot wort being pulled from the taps. 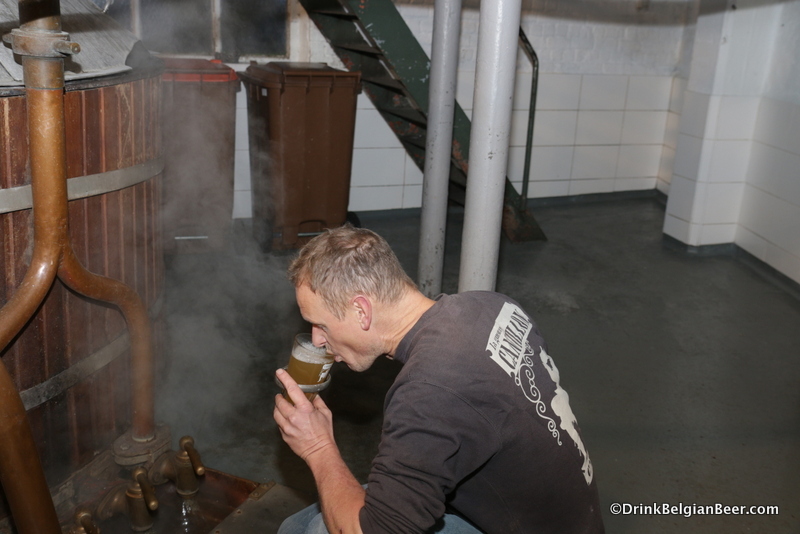 Jean Van Roy tasting the warm wort from the mash tun. 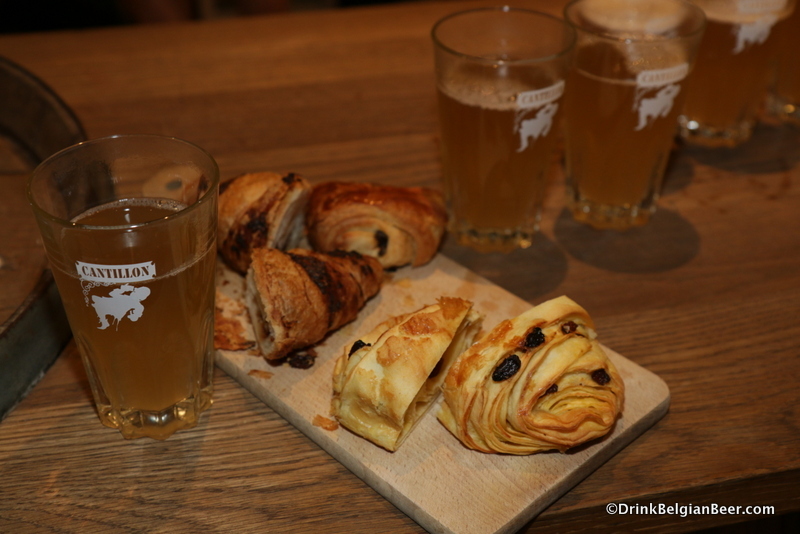 One of the traditions of a brew day at Cantillon is tasting the warm, semi-sweet, tea-like substance called wort, along with croissants. This usually happens about 2 hours after the brewing begins, at around 10 am on (non-public) brew days. 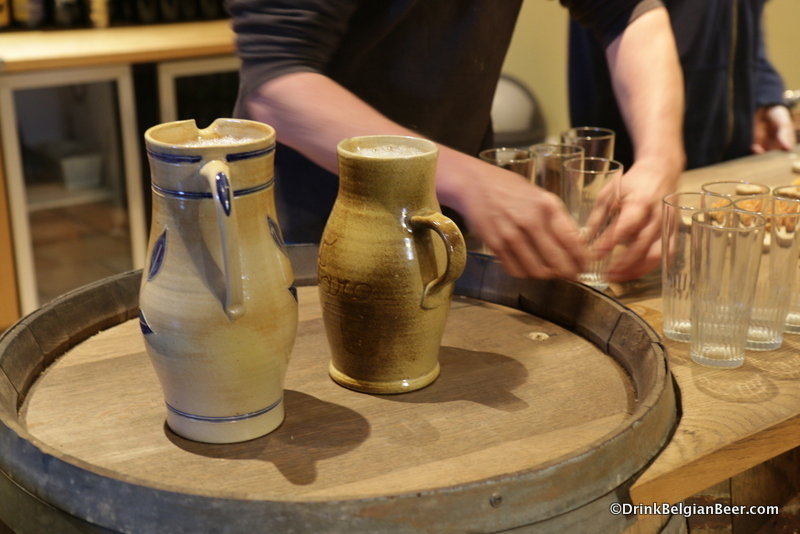 JVR (Cantillon brewmaster Jean Van Roy) filling ceramic pitchers with warm wort. JVR filling a pitcher with warm wort. JVR pulling a pitcher full of warm wort out of the mash tun taps. 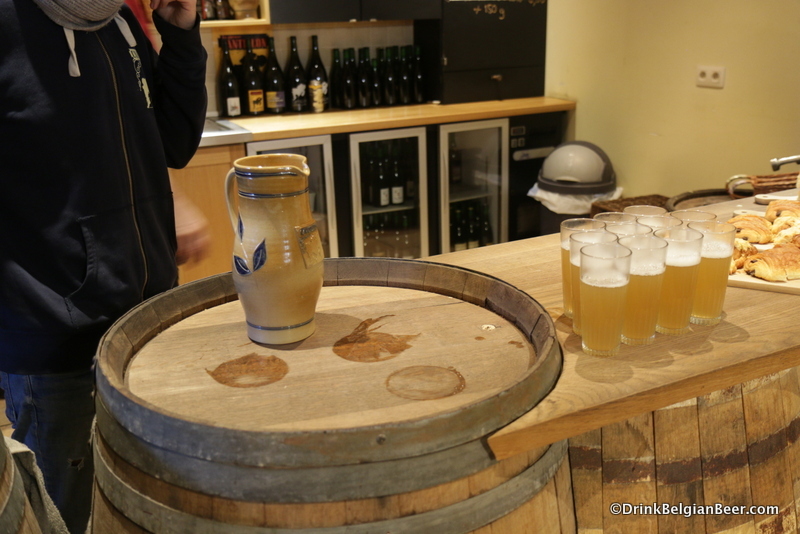 The ceramic pitchers full of warm wort on the bar at Cantillon. Jean Van Roy pouring the warm wort into glasses so those present can have a taste. JVR pouring warm wort so attendees can have a taste. 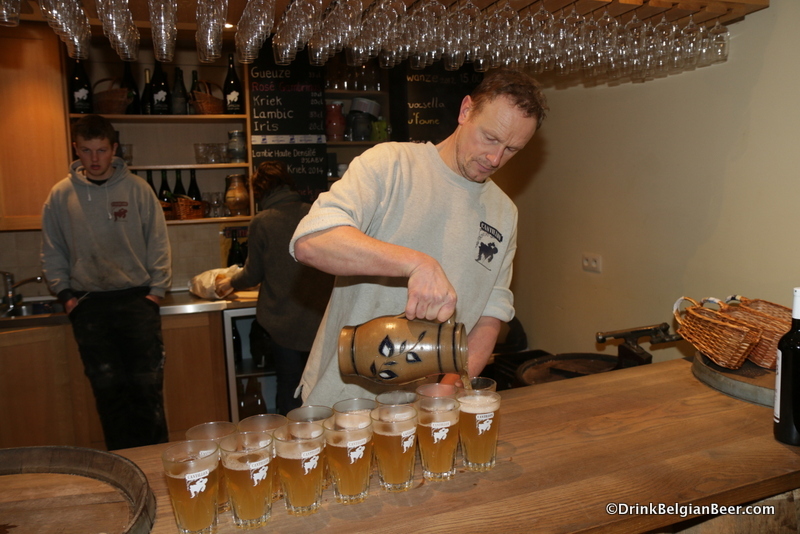 Close up of the hot wort being poured into Cantillon glasses. 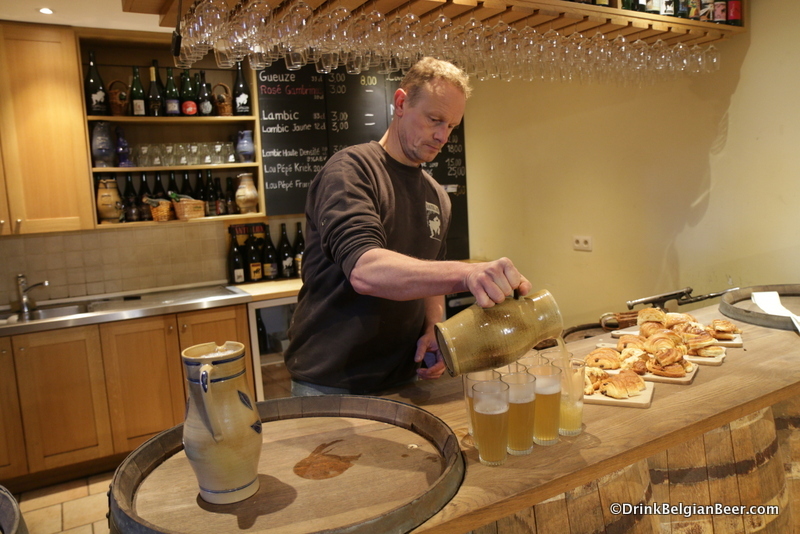 Jean Van Roy pouring glasses of warm wort at Brasserie Cantillon. Jean’s oldest son, Florian, behind and to the left, looks on. 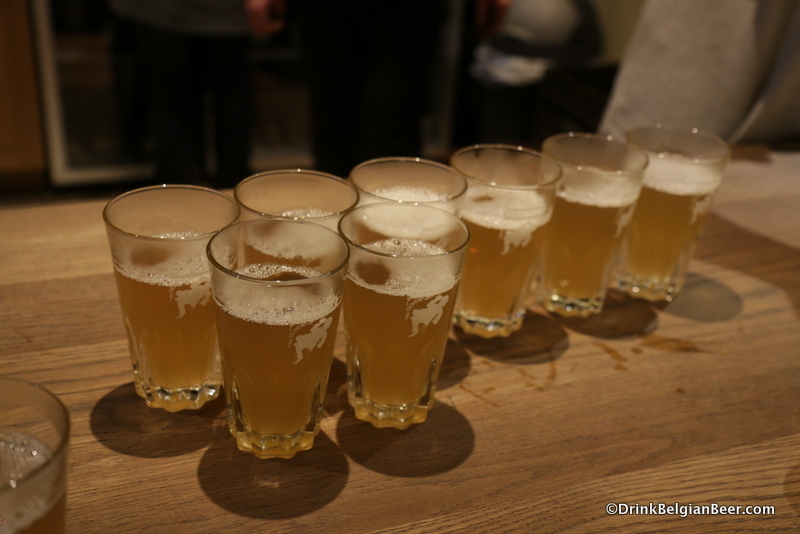 Glasses of warm wort at Cantillon. Another shot of the warm wort, after pouring. 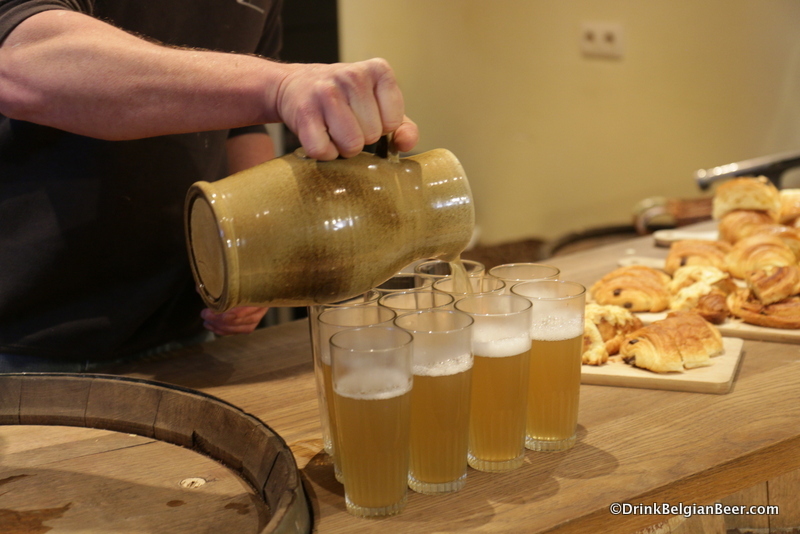 Glasses of hot wort with croissants on the bar at Brasserie Cantillon. 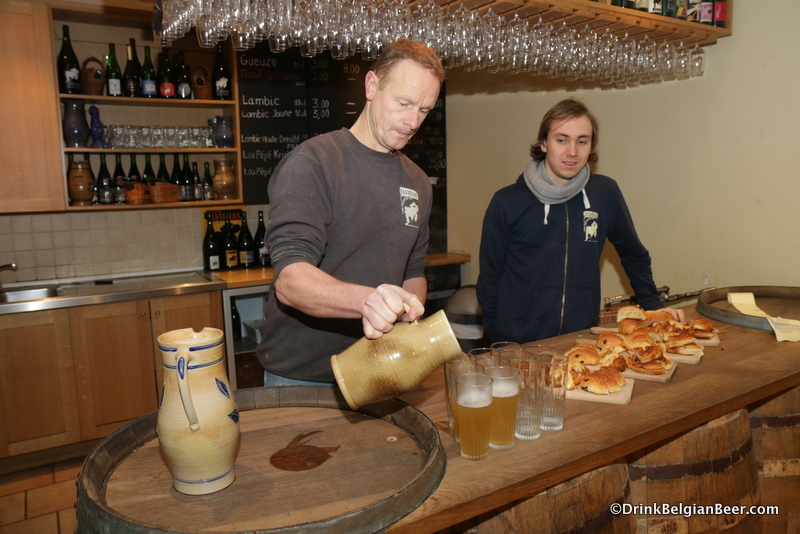 Brasserie Cantillon brewmaster Jean Van Roy tasting the warm wort. The idle mash tun. The action was stopped for a few minutes while those present tasted the warm wort. The mash tun in action again. 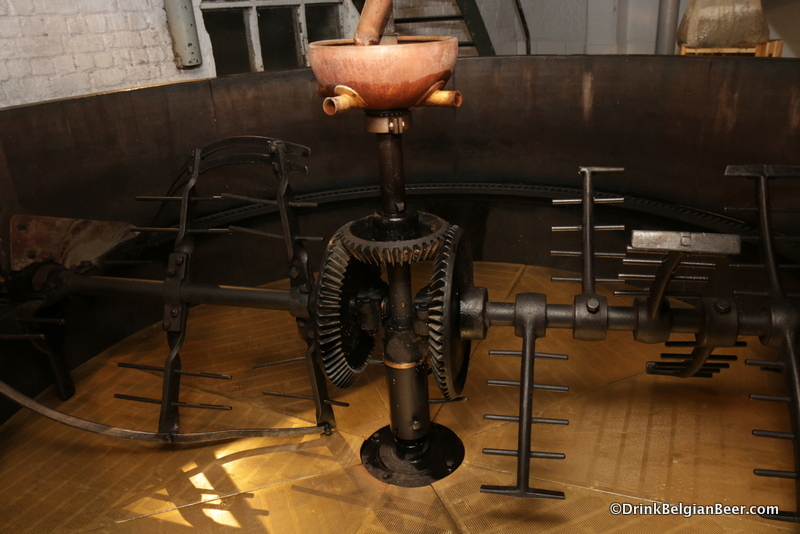 Another shot of belts and pulleys in the mash tun room at Brasserie Cantillon. 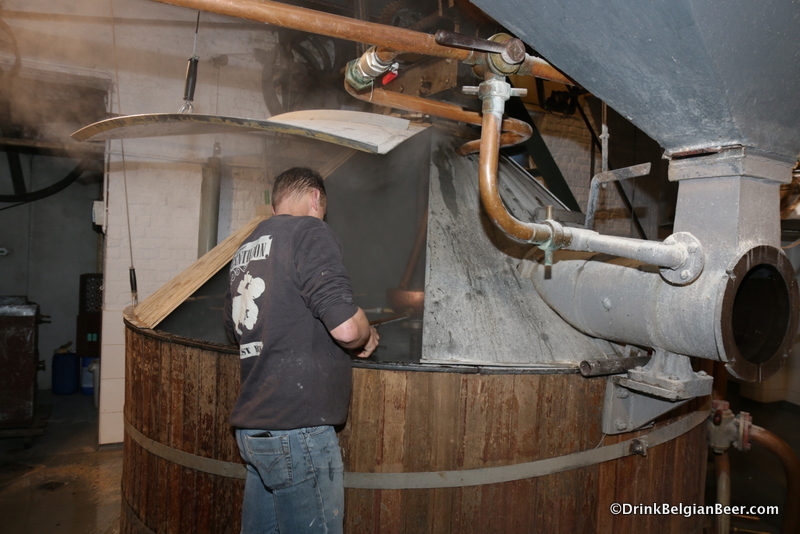 Towards the end of the mashing of the grains, Van Roy attaches copper sprayer arms inside the mash tun at Cantillon. 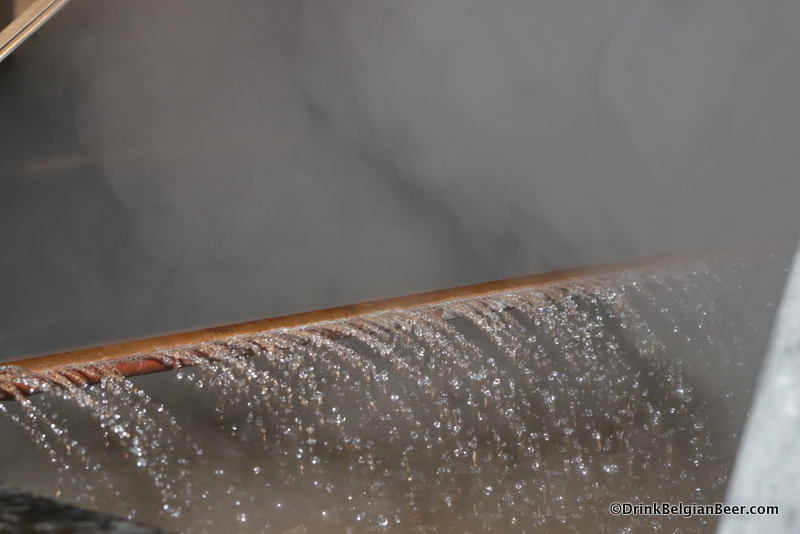 These porous copper tubes spin around in a circle and spray very hot water over the surface of the spent grains, in an effort to extract as much wort as possible from these grains. 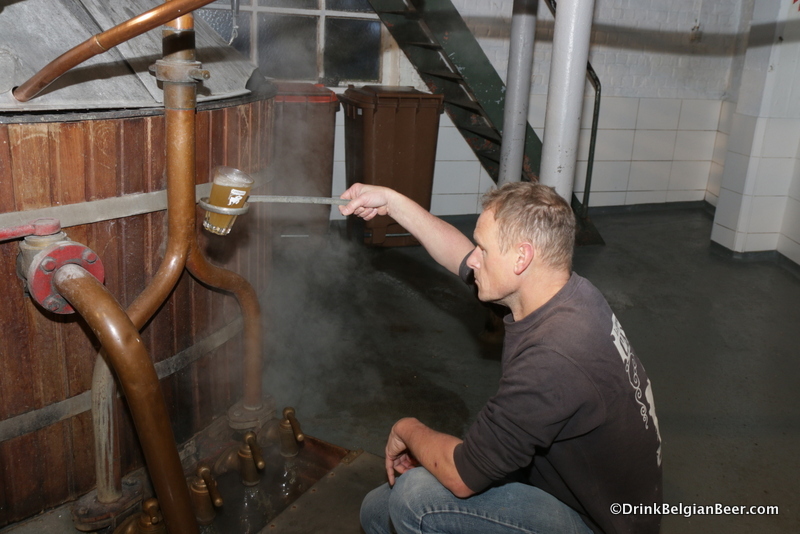 Van Roy says: “We call this in French: ‘lavage des drèches’ of which the literal translation is: cleaning of the spent grains.” See photos below. This process is called sparging in English. JVR adding the sprayer arms to the mash tun. Another shot of JVR adding the sprayer arms inside the mash tun. A sprayer arm in action inside the mash tun at Cantillon. This device sprays hot water over the surface of the spent grains. Van Roy says: “We call this in French: ‘lavage des drèches’ of which the literal translation is: cleaning of the spent grains.” This process is called sparging in English. 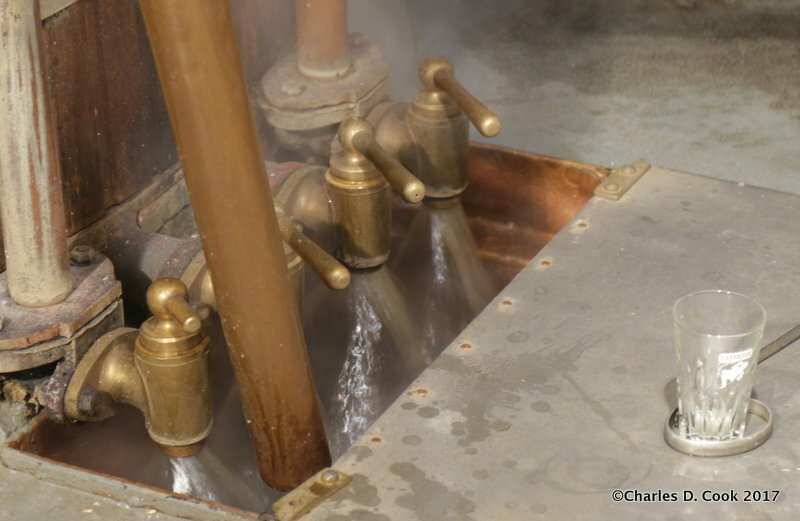 Close up of the “lavage des drèches” or hot water being sprayed onto the spent grains at Cantillon. 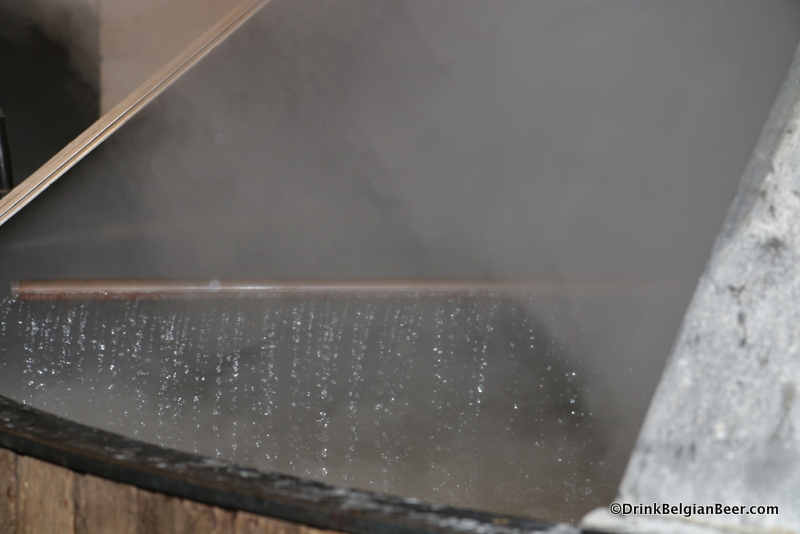 Hot water being sprayed onto the surface of the wort/grain mix inside the Cantillon mash tun. 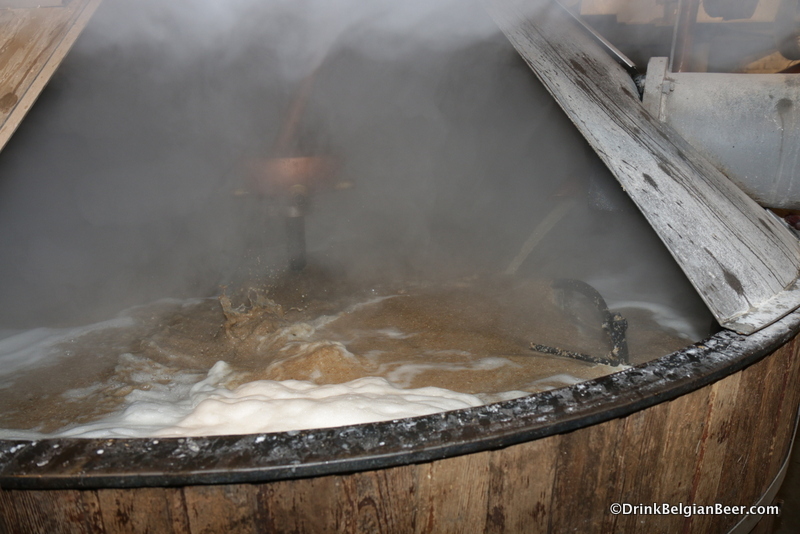 Another look at the Cantillon mash tun in action, during the ‘lavage des drèches’ (sparging) process. 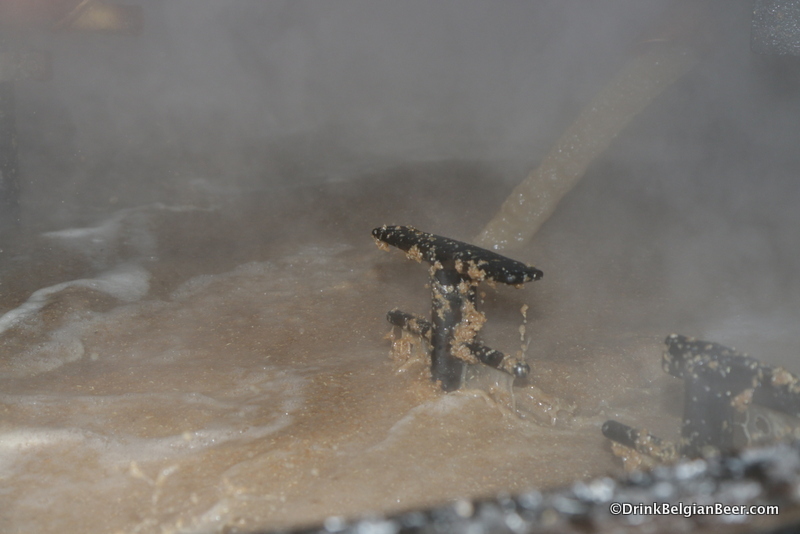 Hot water is being sprayed over the surface of the spent grains. 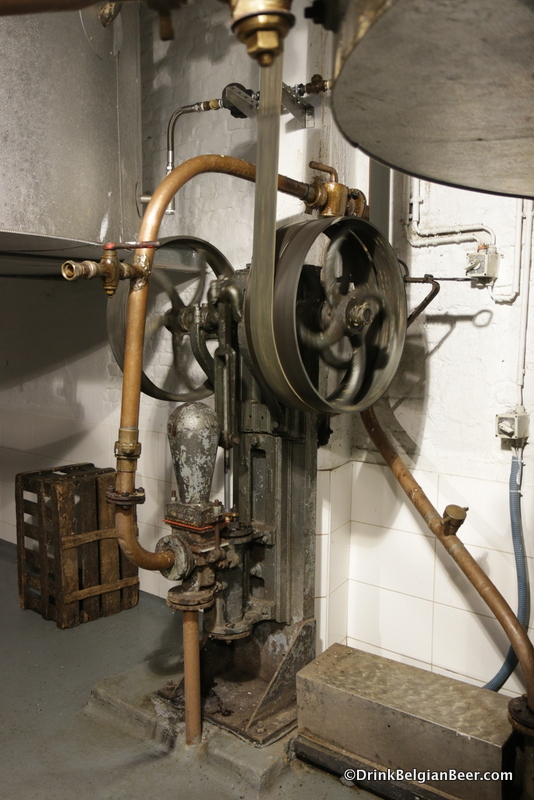 These old pumps and belt-driven pulleys may look antique, but they are an integral part of a working brewery. 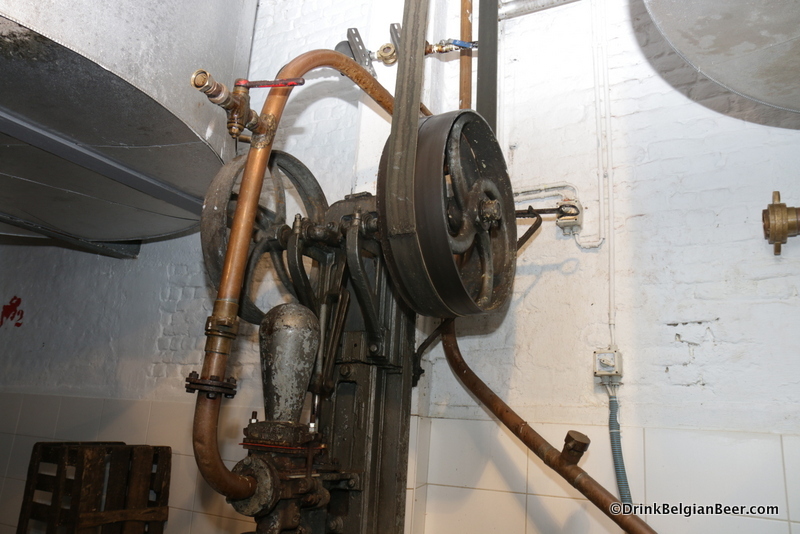 A close up of an old pump with belt driven pulleys and piping. 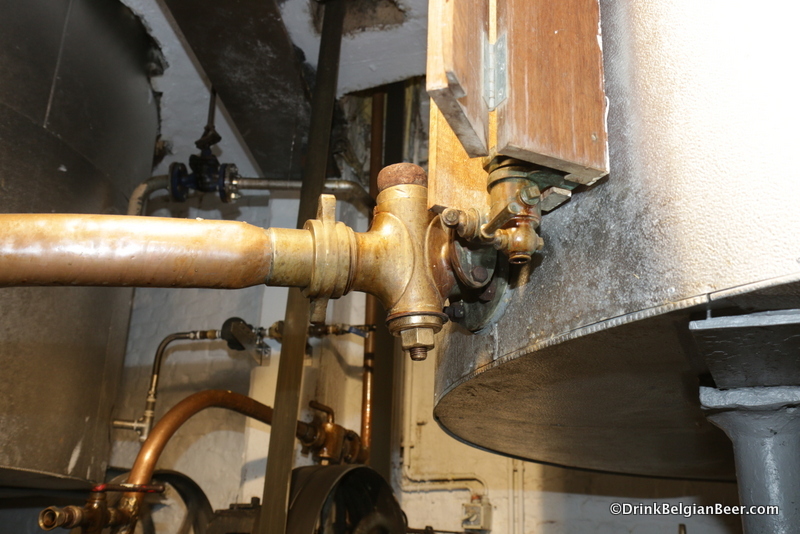 The underside of the “Petite cuve d’ébullition” (Or: “Small boiling kettle”) with copper piping. The top of the kettle is one floor above. 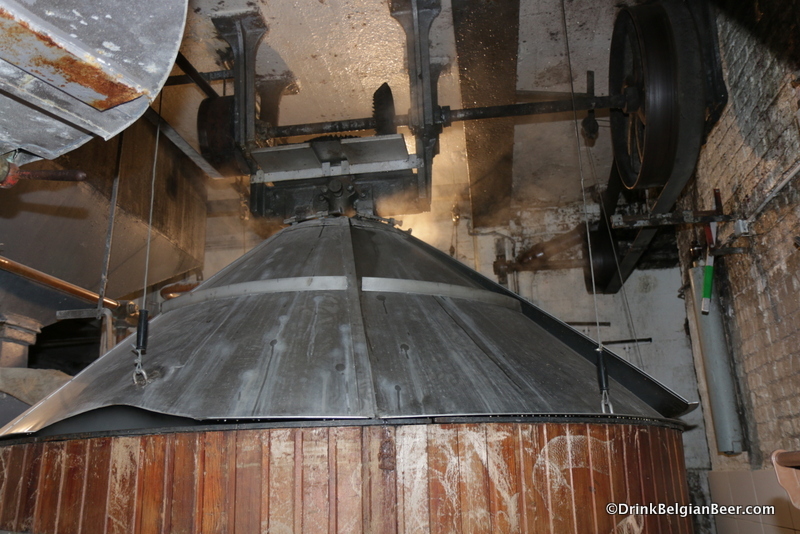 View of the mash tun and the underside of the Grande cuve d’ébullition (Big boiling kettle.) The stairs in the background lead to the second floor, where the brewhouse is located.